The Mini Mum is a pretty rustic looking cigar. The wrapper has a lot of veins of different sizes and varies in shades of color from lighter to darker browns, being darkest at the closed foot end. To put it bluntly, it's ugly like a monster. The stick had a nice give to when squeezed, but was not what I would call soft in any way. The pre-lit aroma smelled mostly of nuts, but also had a hint of clove. The cold draw (or where there was one with a closed foot cigar) tasted again of nuts. I would say hazelnut if I had to pick a certain type. The flavor was strong, which foreshadowed good things to come. I love lighting a closed foot cigar because, in those first few draws, you really get a sense of the wrapper taste. The flavor I got right away on the front of the profile was classic Don Pepin black pepper, which hit mostly on the sides of my tongue, rounded out by a strong cedar flavor. The finish felt very syrupy on my palate and again had smacks of black pepper, but this time knocked down a bit by a leather taste. 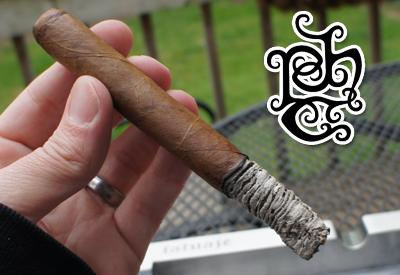 As you can see in the photos, the ash on the cigar was a bright white color (like a mummy, get it? *groan*) and held on strong even smoking outside on a windy day. About an inch into the cigar, the flavors already started to change on the finish and I started to get some clove of the taste I had smelled on the pre-lit aroma. The cigar produced a large amount of smoke and burned effortlessly. The nicotine strength was a solid medium. The second third on my Mini Mum was similar on the front end of the profile with pepper and cedar, but the finish had really taken off. The clove flavor had come on strong and created a nice mix with the leather. Adding to that was some pretty strong cinnamon notes that, for me, took this stage of the cigar to a whole new level. It reminded me a lot of old fashion candies that you would get a a state fair or at the little shop at a Cracker Barrel. (To be 100% honest, I've never been to a Cracker Barrel, but I know they sell what I'm writing about.) It was that spicy, old-fashioned, comes-in-a-paper-bag kind of candy that has sweetness, but only enough to help the spice from being too much. Anyway, it was unique enough that I texted my friend right away and said that this was something different. Also, in the second third, the nicotine strength picked up and I would say it was in the lower full range. I could feel my heart rate pick up a bit, but nothing uncomfortable. Again no burn or construction problems. The final third of my Mini Mum was dominated both on the front of the profile and the finish by the clove/cinnamon/leather combo. Toward the nub, some of the black pepper kicked back in, but that was almost like an afterthought at this point. Just like the difference in the first third to the second third, the nicotine strength continued to pick up and by the end of the cigar was well into the full range. It's a smaller cigar, but it still will keep the full strength guys happy - especially when you get to the latter half of the smoking experience. I burned this cigar until my fingers were burning and it never got sour or hot. Final thoughts on the Tatuaje Mini Mum ? This Little Monster might not be full size like it's big brother will be in October, but it's still a full size monster in flavor. What really shined with this cigar is the finish on each puff and the flavors that last a long time between draws. The combination of clove/cinnamon/leather blended well and made for a winner in my book. I can't wait to get my hands on more of these and am now anticipating the full size Mummy release even more. THis is a Tat I could get interested in. I'd probably split a box. Excellent review Dan. I can see trying to get some of the Mini's myself. Thanks for the great review brother, sound great! I love the idea of smaller RG monsters! I don't think you will be able to get them in a box, only the monster samplers. Nice review Dan, awaiting their arrival. Great review bro. Another Tat to chase!!!! I don't think there will be much chasing this time. A lot of them to go around. Gonna try and score 2 boxes of these. Cant wait for these, especially the mini frank! Can't wait for these! Those mini's are going to sell quick..hopefully there will be enough this time to go around. I gave my last mini Frank away to my friend last week so no formal review on that one. I smoked a handful of them and yup, they are good also. To me they taste just like the original (when it was fresh). thanks again everyone for reading and the comments. Dan, I love reading your reviews! This sampler sounds great. I wonder if there are any plans to to do a "mini-box" of each one? I thought the Frank was fantastic and if the mini tastes the same, I'd be all over those like crazy. hopefully you caught this part.. the regular mummy will be 7 3/4 by 48. I can't wait for that. long smoke! The Little Monsters are slated for a June release in 10 count boxes containing 2 of each of the 5 smaller versions of the Monster series, including this year's release, The Mummy. We were able to smoke 4 of them during the trip (all but the lil' drac) and across the board, everyone will be more than happy with this project! With a retail of $75 and many boxes being produced, this will be a release that everyone will be smoking and not just saving!